Good Day, Regular People: When Do You "Get Over It"
When Do You "Get Over It"
One in seven women will experience postpartum mood disorder. 19 years ago, I was one of those women. It's been almost 20 years, and I still advocate, help raise funds, and share my story. People ask me when I'll get over it. As long as there are women having babies, I won't be "over" it. That time in my life was one of the most challenging, where I learned the meaning of struggle, support, community, the importance of health care and treatment, and hope. Hope was as important as my physician's care and my family's support. I needed to believe I would get better. I had a health care nurse at the time who promised me I wouldn't always feel the way I did. It was hard for me to believe her, I felt I would never get back to who I was. In my bones, I feared I would never "get over" whatever it was that had its hold on me. She told me I would make it through, because she had seen it. I asked her to tell me of every single woman she knew that had survived, and so she did. With a leap of faith, I grabbed those stories of hope and hung on to them until the belief of survival became my own. I saw those dark days through and on to a life of triumph. Women with postpartum mood disorder can get better. For this to happen, we need community, resources, support, awareness, medical care and treatment, and a safe place where we find acceptance and connection. Once the curtain of shame, stigma, fear and isolation are lifted, women can begin their journey back to recovery. And one of the biggest predictors of recovery is SUPPORT. Besides being a proud PPMD survivor, I also am a contributor and Warrior Mom for the national nonprofit, Postpartum Progress. PPP offers in-depth information, community and hope for pregnant and new moms by raising awareness, fighting stigma and providing peer support to women with maternal mental illness. 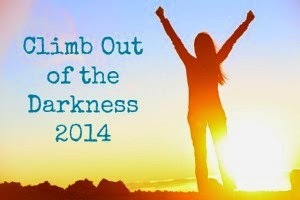 Today, June 21, is national "Climb Out of the Darkness" day for the postpartum information website, Postpartum Progress. COTD is an international fund raising and awareness raising event where 120 teams 40 states and 6 countries climb metaphorically to represent the climb out and the climb back to themselves. It is the world's largest event for moms with PPMD. I am climbing today, along with thousands of other women, because "Together, we are stronger." To see more about Climbs or to find one near you, please click here. Most importantly, if you know of a mother struggling, or if you yourself are experiencing or think you are experiencing postpartum symptoms, please check the Postpartum Progress site for information on how you can find help. Thank you. And to all of my fellow PPMD mamas climbing today, I'm so proud of you. That's exactly it, B. We want to be the hand that once was extended to us. Thank you for sharing your story and continuing to speak out about this. I am a mother of two who continues to struggle with postpartum anxiety, as my youngest is just five months old. Women like you give me the strength to keep going. It is not an easy journey, but I've learned a lot about myself and met some amazing people because of it. Kara, do you belong to postpartum progress community? On Fb, and twitter? Come join us, we are a wonderful place of support and acceptance!!! I am so glad you are in the lives of so many people who need and love you for a variety of reasons...it is beautiful how you share your stories of hope with others who need them! Such an important message. I was there once too and it does get better. Thank you for championing this cause. When I had Reese Ann in 2011, I got hit HARD with postpartum anxiety. I wasn't depressed because I was elated that I finally had this beautiful, wonderful person in my life. It was strange, really. I would sit on the couch and hold her...soaking up her infant perfection...when the thought of "what would happen if..." (i.e. SIDS, car accident, dropping her, etc.) would stifle me with fear. I was terrified that something would happen and I would lose her forever. My love for her was so deep and fierce that I feared how I could ever live without her. My doctor told me that I had anxiety. He was wonderful and understood even when I didn't understand what was wrong with me. I am so thankful for a doctor that knew when I didn't. I love you for sharing your story and for enlightening readers about an issue that is faced by so many.